Is Eurozone Austerity Self Defeating, and is it all Germany's fault? Suppose DeLong and Summers (full paper here) are right, and at the zero lower bound temporary fiscal stimulus leads to an eventual reduction in the debt to GDP ratio because of hysteresis. Does that mean that all this austerity in the Eurozone is counterproductive? This is the question raised by John McHale. Here is an attempt at an answer, followed by some more general remarks on European austerity. 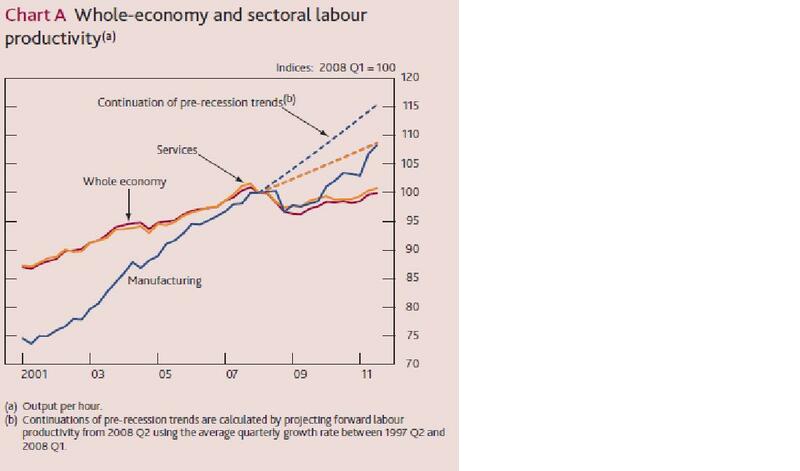 In the stylised picture above, the black line represents the debt to GDP ratio under ‘austerity’. The budget deficit is being reduced rapidly, first to stabilise the debt to GDP ratio, and then to bring it down to safer (more optimal?) levels. ‘Stimulus’ involves in the short term cutting government spending less (at least). Unless multipliers are implausibly large this will raise both deficits and the debt to GDP ratio in the short run (the red line). 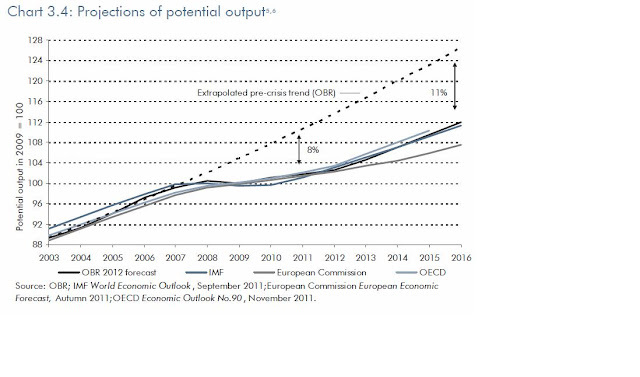 What DeLong and Summers argue is that the negative effects of austerity on output in the medium term will mean that the two paths for debt to GDP will at some point cross. In other words stimulus will at some point lead to a better outcome for the debt to GDP ratio. For any government not having to pay a large risk premium on their debt, and not likely to encounter such a premium, this is an important argument. If true, it does indeed suggest that the rapid austerity being undertaken by countries such as the UK will eventually make their fiscal position worse. In addition, arguments that we have to follow the austerity path because the stimulus path is not credible are beside the point, as I argue here (and see also Summers here). Nor does the argument that we cannot change course now make much sense. In the UK and US fiscal policy does not have to be credible, it just needs to be sensible. In the case of Ireland and other Eurozone countries the immediate motivation for austerity is a high risk premium on government debt. What potential investors in Irish government debt are worried about is not where debt is likely to end up, but the likelihood of default before we get there. Here the credibility argument does apply. One reason why government might default is a political inability to cut spending or raise taxes enough to get the primary budget balance into surplus. Governments can demonstrate that they do have that ability by cutting the deficit rapidly now. Promises to cut it in the future carry much less weight, and so as a result have less impact on the chance of default. Even when the primary balance is in surplus, a government may decide it is in the country’s best interest to default, because any damage to its reputation will be offset by the advantages of not having to cut spending or raise taxes still further to pay the interest on its debt. Once again, a government can demonstrate that it is not minded to do this by reducing its debt as quickly as possible. 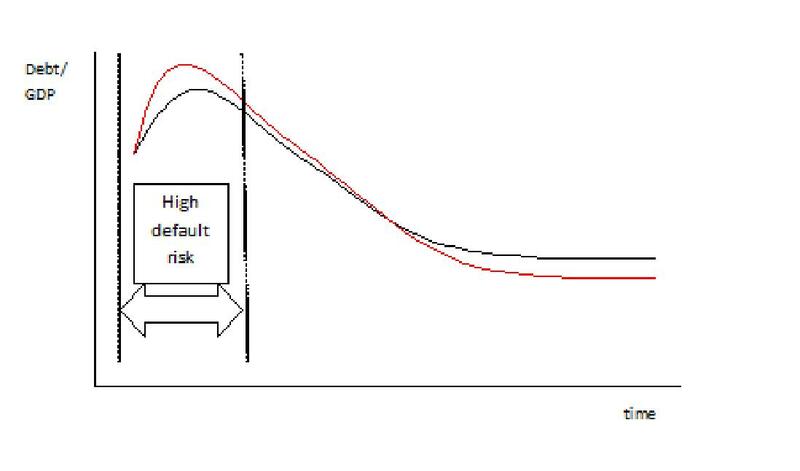 In either case, default is less likely if debt follows the black line (austerity) rather than the red line (stimulus). The markets are, quite rightly, not very interested in what happens into the medium term, because by that time default risk under either policy has all but disappeared. So if the overwhelming priority is to reduce the risk premium on government debt, austerity makes sense. In addition, as I have said often before, a long period of economic stagnation is required in many Eurozone countries to reverse the competitive disadvantage they accumulated relative to Germany in the early years of this century. Which brings us to Germany. In the past I and others have written as if this Hobson’s choice faced by periphery Eurozone countries could be partially relieved if only Germany would expand more rapidly. However, as I outlined here, this was not a very realistic wish. Not because Germany is addicted to current account surpluses –Kantoos rightly argues that this idea is not exactly part of the German macroeconomic objective function. The reason we will not see rapid expansion in Germany is because the economy is doing all right as it is. While inflation of 5% in Germany would certainly be very useful for Spain et al, it would not be in the national German interest. The only possible exception might be if the Eurozone as a whole looked like coming apart, in which case it might be in Germany’s interests to incur these costs. Kantoos’s final question in his post is: ‘So what else should Germany do?’ Germany should be reasonably relaxed about getting its own debt to GDP ratio down. 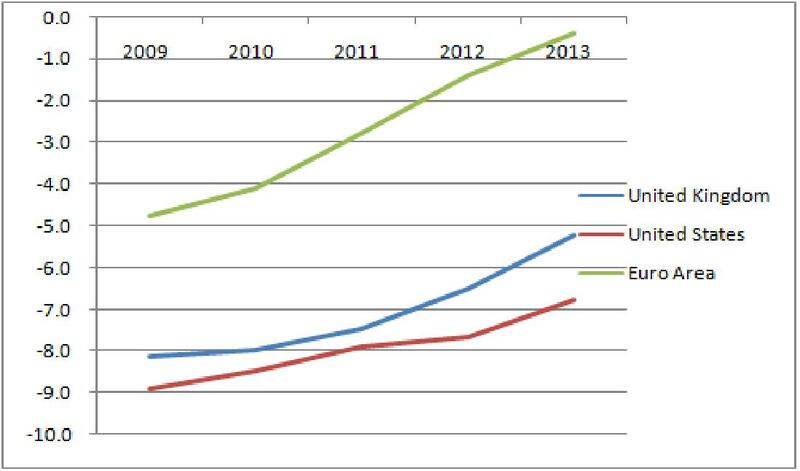 What I have called ‘competitive austerity’ in Europe is not helpful. But being more relaxed on debt is not going to make a big difference to the rest of the Eurozone. So the realistic answer to that question is probably ‘not much’. Seeing the Eurozone as a single bloc, it makes sense to note that fiscal correction in this bloc is far more rapid than in the US or even the UK, and for the area as a whole that will be very damaging. If there was a Eurozone government, it should be undertaking a substantial fiscal stimulus in Germany right now. But to blame Germany for not doing this of their own accord is rather pointless, as Kantoos says in a more recent post. So the only real hope is monetary policy. I’m glad to see that Scott Sumner has decided to bury the hatchet, so let me say some more things that I think he will like to hear. While the arguments for price level or nominal GDP targets are pretty universal, I think they apply particularly to the Eurozone. The discussion above suggests that the barriers to fiscal stimulus in the Eurozone are not political but intrinsic to the union in its current conjuncture, so there appears to be no alternative to monetary stimulus. A change from inflation targeting may also be politically easier for the ECB, because it could be justified as a move back towards the ‘twin pillars’ approach and the Bundesbank’s money supply targeting. Perhaps with a new head the institution can make up for recent mistakes. A major obstacle may be that such a change would not be in Germany’s short term interests (for all the reasons noted above), in which case we may find out how independent the ECB really is from Germany. A Conservative Party Treasurer is caught on camera trying to solicit £250,000 from businessmen by offering to, among other things, feed their suggestions into the policy process at No.10. Having just passed NHS Reform that will greatly increase the involvement of the private sector, David Cameron suggests privatising parts of the road network. Are we seeing either end of a single process here? To which one might respond, as Chris Dillow does, plus ca change. Others, like Stuart Weir, take a less sanguine view. Let us look to the US, which we often need to do to see what happens next. Here we find Paul Krugman helping to uncover the activities of the American Legislative Exchange Council (ALEC). According to Krugman ALEC drafts legislation which is often adopted word for word by US states, is funded by the usual right wing billionaires and corporations, and which has a particular interest in privatisation. It or associated organisations may as a result see advantage in having laws passed that increase business for some of those privatisations, like prisons for example, although of course they would never act on that interest. And equally evident is that this could not happen here. But what exactly is wrong with all this? Presumably it is legitimate for a lobbying organisation to draft legislation that furthers its interest. The organisation does not force legislators to pass it. And what is wrong with people with lots of money using it to fund such organisations? Of course corporations have interests, but it is up to politicians whether they are listened to or not. One thing we can object to is secrecy. It is generally regarded as good practice to declare personal interests where appropriate. For similar reasons it seems appropriate that organisations and think tanks disclose the source of their funding. As George Monbiot has found, in the UK at least that is quite hard to persuade them to do. I cannot see any justification for keeping this information secret. The default position is that we should be automatically suspicious of any organisation that allows its benefactors anonymity, and discount its output accordingly. Why does disclosure matter? In an earlier post, I talked about how the media tends to have two ways of framing issues: either there is general consensus, or there are two sides to every question. With that two category model, it is quite important which category the media decides to put a particular issue into. Moneyed interests can manufacture controversy through think tanks, as has happened with aspects of the climate change debate. It is therefore important that everyone, including the media, know where organisations get their finance. More generally, the media needs to be a little braver in going beyond the spin and ‘following the money’. There are also limits on what money should be allowed to do in the political process. If some organisation or individual offered to directly buy your vote, this would be illegal in most places. Where it becomes less clear is when we move to political advertising. Now of course if we try and pretend that advertising is just about providing information, and that there are adequate safeguards to ensure advertised information is always ‘true’, then we might believe the more information people have the better. However those would be foolish things to believe. In a previous post I wrote ‘money buys votes’. Immediately on writing that my academic self thought, hold on, should I not qualify that a bit, but then I thought don’t be silly. Of course advertising in elections, as one commentator pointed out, does not guarantee that votes will follow, just as advertising a commodity can be more or less successful. But the correlation is surely positive. If advertising is about persuasion, or more pejoratively manipulating minds, then should we allow one political party a greater opportunity to do this than another? If the answer is even a qualified no, then I think we are entitled to put limits on how much money political parties or their supporters can spend. (In the UK this is done at election time, but the logic implies limits should operate at all times.) It also, in contrast to Chris Dillow’s view here, suggests that there should be limits on how much individuals are allowed to contribute to political parties. When the need for internal theoretical consistency (microfoundations) and external empirical consistency (matching the data) conflict, what do you do? You might try and improve the theory, but this can take time, so what do policy makers do in the meantime? There are two ways to go. The first is to stick with microfounded models, and just deal with their known inadequacies in an ad hoc manner. The second is to adapt the model to be consistent with the data, at the cost of losing internal consistency. Central banks used to follow the second approach, for the understandable reason that policymakers wanted to use models that as far as possible were consistent with the data. However in the last decade or two some central banks have made their core macromodels microfounded DSGE models. I have not done a proper survey on this, but I think the innovator here was the Bank of Canada, followed by the Reserve Bank of New Zealand. About ten years ago I became heavily involved as the main external consultant in the Bank of England’s successful attempt to do this, which led to the publication in 2004/5 of the Bank’s Quarterly Model (BEQM, pronounced like the well known English footballer). I think it is interesting to see how this model operated, because it tells us something about macroeconomic methodology. 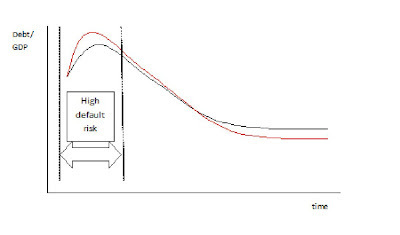 If we take a microfounded model to the data, what we invariably find is that the errors for any particular aggregate relationship are not just serially correlated (if the equation overpredicts today, we know something about the error it will make tomorrow) but also systematically related to model variables. If the central bank ignores this, it will be throwing away important and useful information. Take forecasting. If I know, say, that the errors in a microfounded model’s equation for consumption are systematically related to unemployment, then the central bank could use this knowledge to better predict future consumption. BEQM addressed this problem by splitting the model into two: a microfounded ‘core‘, and an ad-hoc ‘periphery’. The periphery equation for consumption would have the microfounded model’s prediction for consumption on the right hand side, but other variables like unemployment (and lags) could be added to get the best fit with the data. However this periphery equation for consumption would not feed back into the microfounded core. The microfounded core was entirely self-contained: to use a bit of jargon, the periphery was entirely recursive to the core. Now at first sight this seems very odd. If the periphery equation for consumption was giving you your best prediction, surely you would want that to influence the core model’s predictions for other variables. However, to do this would destroy the internal consistency of the core model. Let us take the hypothetical example of consumption and unemployment again. In the core model unemployment does not directly influence consumption over and above its influence on current and future income. We have found from our periphery equation that we can better explain consumption if it does. (Unemployment might be picking up uncertainty about future income and precautionary saving, for example.) However, we cannot simply add unemployment as an extra variable in the core model’s equation for consumption without having a completely worked out microfounded story for its inclusion. In addition, we cannot allow any influence of unemployment on consumption to enter the core model indirectly via a periphery equation, because that would destroy the theoretical integrity (the internal consistency) of the core model. So the core model has to be untouched by the ad hoc equations of the periphery. So this core/periphery structure tries to keep our microfounded cake, but also eat from the additional knowledge provided by the data using the periphery equations. Now the research goal is to eventually get rid of these periphery equations, by improving the microfounded model. But that takes time, so in the meantime we use the periphery equations as well. The periphery equations utilise the information provided by the statistical properties of the errors made by the microfounded model. I think this core/periphery structure does nicely illustrate the dilemma faced by policy making institutions. They want to follow current academic practice and use microfounded models, but they also want to use the information they have about the limitations of these models. The core/periphery structure described here can be criticised, because as I suggested this information is not being used efficiently without feedback to the core . However is there a better way of proceeding? Would it be better to compromise theory by changing the model so that it follows the data, which in BEQM’s case would merge core and periphery? It is sometimes suggested that this is a conflict between forecasting and policy analysis. The example involving consumption and unemployment was chosen to show that this is not the case. The data suggests that the microfounded model is missing something, whether we are forecasting or analysing policy, and the question is what we do while we figure out exactly what is missing. Do we continue to use the wrong model, confident in the knowledge that the stories we tell will at least be consistent, albeit incomplete? Or do we try and patch up the model to take account of empirical evidence, in a way that will almost certainly be wrong once we do figure out properly what is going on? What has this to do with academic macroeconomics? Perhaps not much for the macroeconomist who builds microfounded DSGE models and is not that involved in current policy. Microfounded model building is a very important and useful thing to do. For the profession as a whole it does matter, because the central banks that now use microfounded DSGE models do so because that is how policy is analysed in the better journals. Academic macroeconomists therefore have some responsibility in advising central banks how they deal with the known empirical inadequacies of those models. When the data tells us the model is incomplete, how do you best use that information? The symbolic centre piece of the UK budget was cutting the top rate of income tax. There has been and will be plenty written on the merits or otherwise of this (see Chris Dillow for example), but I want to raise a broader point about political influence. To do that I will start with the UK and US, but then move to Uzbekistan and Nepal, before returning to the US and finally back to the UK. Let us start with trends in inequality. 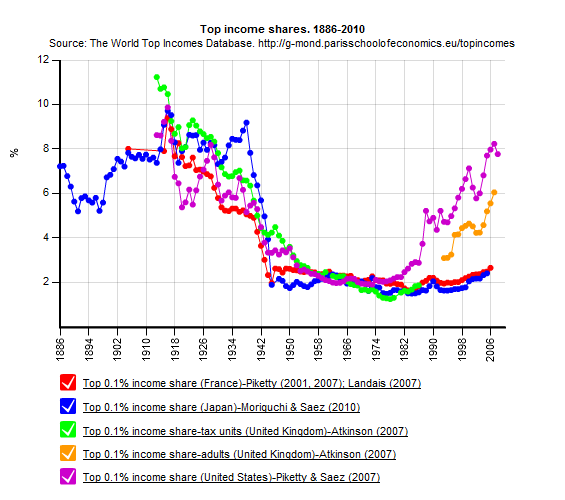 The distribution of income in the UK has been getting steadily more unequal over the last two decades. As this chart makes clear, we are following in the footsteps of the US in this respect. There has been a great deal written about this trend. Is there a similar trend in inequality of opportunity, and are they linked? Just how many measures of health and social wellbeing are negatively correlated with inequality? But rather than discussing this, I want to move to Uzbekistan, Sierra Leone and Nepal. In a fascinating series of blog posts (trailing a book just published called Why Nations Fail), Daron Acemoglu and James Robinson tell stories about why these economies failed to develop over long periods of time. The common theme is that an economic and political elite (a dictator, a tribe) had established a system of extracting the surplus from an economy, and either that system prevented development (children spent a large amount of school time picking cotton in Uzbekistan) or development threatened this extractive system (the caste system in Nepal). Now move back to the US, and Larry Bartels’ book published a few years ago called ‘Unequal Democracy: The Political Economy of the New Guided Age’. Although Bartels notes that technology and globalization have contributed to growing inequality over the past 35 years, he finds that Republican policies on macroeconomics, taxes, and social spending have produced substantial increases in inequality, while Democratic policies have produced relatively equal income growth across the economic spectrum. The real incomes of working poor families have increased six times as fast under Democratic presidents as they have under Republican presidents. The corollary, of course, is that the wealthy have gained under Republican presidents – the Bush tax cuts, for example. So finally back to the UK. The influence of money on politics here is perhaps more discrete. Take the major reform of the National Health Service (NHS) that has just been passed into law. This was not part of the government’s pre-election manifesto: in fact the prime minister appeared to rule out such a reorganisation in the campaign. The reform is opposed by nearly every professional association involved in the NHS. It is supposed to give more power to local doctors, yet the Royal College of GPs suggest it will "cause irreparable damage to patient care and jeopardise the NHS". A former NHS chief executive describes the bill as a mess that will set the NHS back. With the reorganisation happening at the same time as fiscal austerity, the political pay-off for the next general election is almost certainly negative. So why pursue it? Well, one group that will benefit are the private companies that will do a lot of extra business as a result of the reforms. These companies are - how can I put it - well connected in various ways. When business sees more profit in rent seeking and manipulating the state compared to investment and innovation, economic growth suffers. Which brings us finally back to the Budget and the 50p tax rate. The campaign to get rid of the 50p rate has been well organised, and has signed up many business leaders for support. 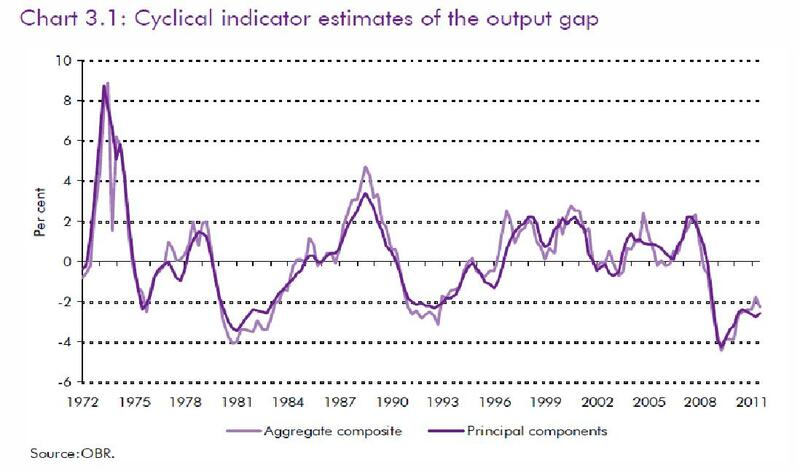 The evidence that it will have a noticeable effect on UK growth in the next few years is non-existent. What UK business should have been lobbying for were changes in monetary and fiscal policies, but this has not happened in the UK or US. That the key 2012 Budget measure is a cut in the top tax rate, at a time when unemployment is rising because of demand deficiency, represents a specific macroeconomic policy failure. That the business community appears to be backing this stance perhaps represents a more general political problem. This month’s Economic Journal sees the publication of a paper by Tatiana Kirsanova and myself that asks how quickly fiscal policy should respond to excess government debt. It is a very topical issue, but we started work on it back in 2004. It was Tanya’s idea so she deserves the credit for any foresight. The set up is both straightforward and not too unrealistic. We assume that monetary policy pursues an optimal policy, and that it has the credibility to commit. (We ignore the zero lower bound problem - it is not that topical!) In contrast, fiscal policy involves a simple feedback rule: following some shock, either government spending or taxes are adjusted by some proportion of the level of excess debt. The economic model is of a pretty standard New Keynesian variety. We also ignore the possibility of default on debt. Following various shocks, we look at how social welfare changes as the speed of fiscal feedback varies. The idea was not just to find out what the optimal degree of feedback is, but also to observe how much welfare suffers if we depart from this optimal speed. One extreme case is where there is no fiscal feedback – the fiscal authorities just ignore debt completely. The presumption might be that this would lead to an explosive debt spiral. In fact it does not, because monetary policy manages to control both debt and inflation. The way it does this is clever (remember policy is optimal, so it can be clever). Following a shock that raises debt, it first cuts interest rates, which helps get debt under control. It subsequently raises interest rates, which controls inflation. The reason this works is that the inflation process, unlike the government’s budget constraint, is very forward looking – the model is New Keynesian. With rational expectations, promises of higher interest rates in the future help control inflation today, while lower interest rates today keep debt under control. (Those who follow such things may detect an element of the Fiscal Theory of the Price Level here.) However, although the economy is stabilised, inflation is not controlled very efficiently, and so the welfare costs of the shock are high. At the other extreme is where fiscal feedback is very rapid: government spending (say) is cut very quickly in response to a shock that raises debt. This does better in welfare terms, but it is not the best policy for two reasons. First, quickly cutting government spending has costs. Second, large changes in government spending mess with inflation. If a shock raises both debt and inflation, you might think this is a good thing, but in this type of model monetary policy is better at controlling inflation than fiscal policy. Having both fiscal and monetary policy control inflation actually reduces welfare. The best amount of fiscal feedback turns out to involve pretty slow correction of debt. Although this is an important result, it was not unexpected or very new. This is because the ideal fiscal policy (when both monetary and fiscal policy are jointly determined in an optimal manner under commitment) in this type of model would not eliminate excess debt at all. It is better to allow debt to change permanently as a result of a shock: although this means either government spending or taxes will have to change permanently to finance this debt, the discounted costs of this are less than the large short term changes in fiscal policy required to eliminate all excess debt. (This is an implication of Barro’s famous tax smoothing result.) A simple feedback rule cannot duplicate this ideal policy exactly, but it can get pretty close by not reacting very much to excess debt. The result that it is best to correct debt very slowly is neither surprising nor unusual – a similar conclusion is reached by most papers that look at this issue. In that sense it is a robust result. In more recent work that I have done with Campbell Leith and Ioana Moldovan, where the ideal policy is no longer to accommodate shocks to debt, we still get very slow adjustment. The more interesting result in the paper is quantifying the degree to which welfare deteriorates when we try and correct debt too quickly. Controlling debt too quickly is never as bad as not controlling it at all, but it is significantly worse than more gradual adjustment. Trying to correct debt too rapidly is costly, and should be avoided if possible, even when we are not at the zero lower bound. One interesting result that surprised me at the time was how well the simple feedback rule for fiscal policy did compared to the ideal fiscal policy (i.e. a joint optimisation benchmark). I now know that this reflects a fundamental property of this basic New Keynesian model, which is that in many cases, and in the absence of the zero lower bound, monetary policy is all you need for stabilisation of output and inflation. (This is well known for demand shocks, but it turns out to be more general than that.) With the help of Fabian Eser and Campbell Leith, we show this analytically here. Of course if monetary policy is compromised by hitting a zero lower bound for nominal interest rates, this result no longer holds. In this case you would want fiscal policy to help out on output stabilisation, as Gauti Eggertsson has examined in a number of papers. The position is similar to that of an individual economy in a monetary union. Tanya and I showed in joint work with Mathan Satchi and David Vines that the simple feedback rule on debt should be supplemented with additional terms reflecting this dual role in a monetary union. About two years ago, there was a debate via letters to newspapers over how quickly UK debt should be brought down. I’m told that when one of the economists who signed the ‘cut quickly’ letter saw Tanya present this paper, they said that they now understood why I had signed the ‘cut slowly’ alternative. And for those who would say ‘ah yes, but slow correction would not be credible’, read this. In the austerity versus stimulus debate, I argue from a macroeconomic point of view that this is a false choice if we are talking about economies where markets are eager to buy government debt i.e. pretty well everywhere apart from the Eurozone. In the short term we need stimulus, whereas fiscal discipline is a long term problem. We need to raise taxes and cut spending when times are good, not when times are bad. The Eurozone 2000-2007 is a clear example of when this should have happened. The response is often to concede the macroeconomic logic, but say that promises of austerity tomorrow cannot be trusted. It is easy to promise, but when tomorrow comes governments will break that promise. This resonates, but it is less clear what the underlying logic is. We can all agree that governments are subject to deficit bias. There are a number of reasons for this: the common pool problem, over optimistic forecasts, political impatience stemming from elections etc. (See Calmfors and Wren-Lewis, 2011, for a more complete account.) However bias stemming from these causes is fairly constant: it does not disappear when deficits are high and only materialize in good times. I sometimes put it this way. Suppose the government did go for fiscal stimulus today, and this helped lead to a macroeconomic recovery. Once the recovery was complete, the underlying fiscal position (i.e. the structural or cyclically adjusted deficit) would be a little worse than today, because the stimulus would have added to debt. So if a politician is prepared to undertake austerity today, they will be even more willing to undertake it tomorrow. Of course following a recovery the actual (rather than structural) deficit may be smaller, but is our macroeconomic discourse that naive? In economics we are of course used to the optimal policy changing solely as the result of the passage of time (time inconsistency). A central bank may promise to keep interest rates high for some time to reduce inflation today, but come tomorrow when the policy has done its job it becomes optimal to reduce interest rates. However when it comes to fiscal policy and deficit bias, the role of time inconsistency seems less central. The problem is not that we have a benevolent policy maker that is subject to a time inconsistency temptation; it is that we do not have a benevolent policy maker. Having said this, I think many feel that, when governments are prepared to act ‘out of character’ and impose restraints on themselves, this chance should be grabbed before it disappears. It is often possible, when looking at countries where government debt is not a major problem, to trace this back to changes made following a fiscal crisis. Lars Calmfors has a nice account of the Swedish case here. So can we rationalise this idea? Perhaps a crisis, and therefore the chance to act, is not governed by the level of debt (funding problems aside), but by its rate of change. So governments became prepared to impose austerity when debt started rising rapidly following the recession, but if nothing was done and debt remained high, the political imperative would gradually disappear. Higher debt would become the new normal. However I still have problems with this line of reasoning. As Lars emphasises, Sweden was successful because it instituted a comprehensive set of reforms following the crisis, including a fiscal target to be achieved over the course of the cycle. It was also successful because a large nominal depreciation boosted output growth, more than offsetting the deflationary impact of fiscal consolidation. The world as a whole cannot use this trick, so an important condition for successful global fiscal consolidation is missing. However countries could establish rules today that were designed to only begin operating when the economy has recovered. Use the current crisis to get the rules established, but recognise that their implementation needs to be delayed because of the recession. It is often said that instituting rules that only operate once the recovery is complete will ‘not be credible’. Here is the time inconsistency analogy again, and (funding crisis aside) it seems equally inappropriate. We just need to ask: credible to whom? Is a government that commits to future austerity that begins tomorrow, any more likely to renege in the future than that same government that commits to long term austerity and starts it today? We could argue the opposite: an austerity plan in conjunction with a recession is more likely to come unstuck. I think a mistake we can make here is to imagine we are trying to discover the preferences of two different governments. In that case, a government that just promises future austerity tells us very little, because it could just be cheap talk. If a government undertakes austerity now, we know more through its actions. However that is not what the current debate is about. In practice we have governments that are prepared to undertake austerity now. They have demonstrated that they take the debt problem seriously. Are these preferences going to change if we delay austerity until after the recovery? So let us, by all means, not waste a fiscal crisis. Use it to set out a combination of rules and institutional changes that avoid deficit bias in the future. However I do not see why it is politically impossible to delay the implementation of those rules until after the recession is over. But maybe I’m just displaying my ignorance of political science. The new Bruegel blog has a provocative post entitled ‘Europeans can’t blog’. What they mean is that there is no equivalent in Europe to the US economics blogosphere. To quote: “It is striking to note that the online debate about European economic issues mostly takes place on American blogs.” European blogs exist, but Bruegel suggest that they tend not to link to each other, so debate is not encouraged. This is partly a language issue of course, with many blogs directed at a national audience written in their own language. But the language of economics is English, and there are already some good European blogs written partly or totally in English. Bruegel thinks it would be good if there was a more interactive European economics blogosphere, and I very much agree. I know I’m not the only person who wants to understand more about the economic debate in other European economies, particularly at the moment. Discussion through blogs might even improve the quality of national economic debate. But what I really wanted to say is that it need not take long to achieve this. At the end of their post Bruegel kindly say that the “UK already has an impressive blogosphere that is tightly integrated with the American one”. The Palgrave Econolog ranks economics blogs mainly by the number of incoming links from other indexed economics blogs i.e. a bit like Google. Of their current top 20, 15 are US based, one is Canadian, one is the IMF, and 3 are from the UK. But of these three UK blogs, only Chris Dillow’s Stumbling and Mumbling was around six months ago. When I and Jonathan started blogging, Chris linked to some of our posts, which meant Mark Thoma read them etc. Bruegel shows one way a new and interesting blog can be created, based around an internationally orientated economics think tank, research center or academic department. Alternatively, I’m sure I’m not the only economics professor who would find they had things to say. There are some really good US blogs by current or recent grad students, like Noahpinion for example. Once the critical mass is there, Bruegel's post and my own experience emphasise the importance of interacting with other blogs. Mark Thoma bemoans the attitude of inflation hawks on the FOMC (the US equivalent of the Bank’s Monetary Policy Committee). He writes “Unfortunately, the hawks on the committee seem to be afraid that if they allow inflation to creep up even a little bit over their long-run target, the inflation flood gates will open and they won’t be able to help themselves from a repeat of the 1970s.” From this profile by Roger Lowenstein, the floodgates view may not be confined to the hawks (HT Karl Smith). It occurred to me that we have just had a little experiment in the UK to test this floodgates view, and it looks like being completely rejected. The first chart shows the basics on inflation. The inflation target is 2%. Before 2005 the Monetary Policy Committee (MPC) of the Bank of England had done pretty well : since getting independence inflation had been close to the target. (The target measure of inflation was different at the start, but we do not need to get into these complications.) Since 2005 inflation has been consistently above target, and seriously so over the last two years, hitting a peak of 5.2%. What have been the consequences? 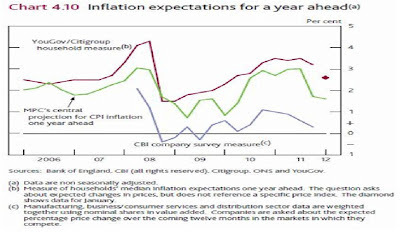 The figure below, from the Bank’s latest inflation report, showed what happened to one year ahead inflation expectations. The first point to note (see the green line) is that the Bank did expect to exceed its target (it opened the floodgates! ), but the extent of the inflation overshoot was not foreseen. The second is that inflation expectations, as measured by surveys of households, did rise to somewhere between the Bank’s forecast and what actually happened. Similar surveys asking about longer term inflation expectations give numbers between 3% and 4%, which even after allowing for definitional issues is well ahead of the inflation target. Market measures based on swaps show a similar story for longer term inflation expectations. (There are lots of caveats that I’m ignoring, for reasons I hope will become clear. The limitations of these surveys, and others, are discussed in detail by MPC member Adam Posen here.) This is despite the Bank’s forecast, backed up by most other forecasters, which sees inflation coming back to target during this year. So in a sense this seems to confirm some of the hawks’ fears. 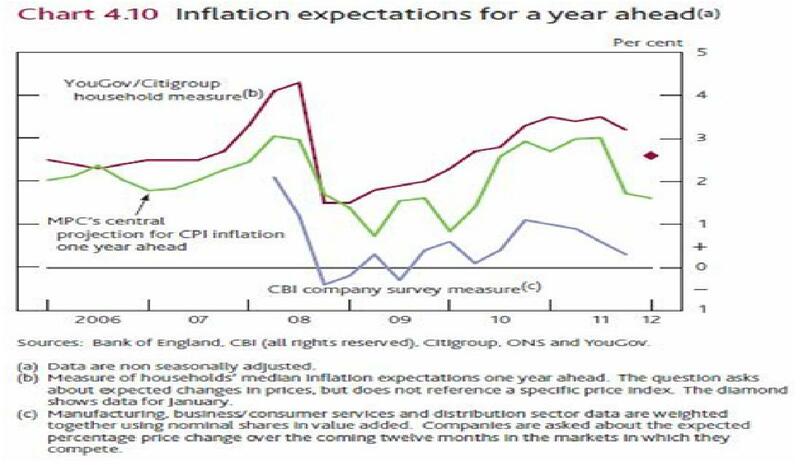 Inflation expectations are now above target, and they are not coming down in line with forecaster’s projections. Has this started a wage-price spiral, with inflation out of control? In a word, no. From the peak of 5.2% in September, inflation has fallen rapidly, and was 3.6% in January. The OECD expects year on year inflation to be 2.7% in 2012, and only 1.3% in 2013. What we have seen is a classic and temporary cost push or supply shock caused by a VAT increase and rising commodity prices. 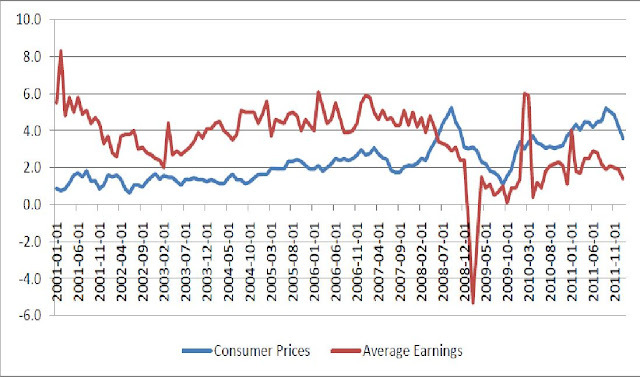 The reason why all the talk of inflation out of control was nonsense can be seen in the other line from the first chart, which is average earnings inflation. Before the recession, wage inflation was always above price inflation, which is what we would expect because of underlying productivity growth. Since the recession, wage inflation has been invariably below price inflation, which is a consequence of rising UK unemployment. The latest figure for January, released yesterday, gives a year on year increase in earnings of only 1.4%. So, despite a significant inflation overshoot (part planned, part unplanned), a (modest) rise in inflation expectations, and a huge increase in the monetary base as a result of quantitative easing, there is absolutely no sign of a take-off in inflation. This should not be a surprise. Sustained increases in inflation involve wage-price spirals, and given high and rising unemployment we are not seeing the wage part of this process. However, this does not prevent inflation hawks being inflation hawks, and others getting cold feet. In the spring of last year, 3 out of 9 members of the MPC voted to tighten monetary policy. That did not make sense in terms of the standard way we think about monetary policy (see my earlier post here), but it did make sense if you believed in a floodgates kind of world. You might think this does not matter too much, because the hawks are in a minority. However the floodgates view makes it much more difficult to have a sensible public discussion about using promises of higher future inflation to mitigate the zero bound constraint. (This could involve temporarily raising the inflation target, or switching to a price level or nominal GDP target.) As I noted here, there is very little discussion of this option in the UK (although this is a notable exception). I do not think such a monetary policy is an alternative to fiscal stimulus – in fact the two policies can complement each other, as Brad DeLong points out here. However, if a significant proportion of the monetary policy making community view inflation above 2% as the equivalent of just one drink for an alcoholic, then using inflation as a tool rather than just a target will not happen. Of course this UK episode is not the same as raising inflation above 2% when the real economy is no longer depressed, as would occur under a nominal GDP target, but I think it does require those who oppose this policy change to explain why things would be very different in that case. I would draw one other lesson from this experience. When thinking about inflation, it is a mistake to focus on consumer price inflation alone. We can try and take out various things from the consumer price index to get some ‘core’ measure, but there are two alternative inflation measures already published: output prices (the GDP deflator) and average earnings. We should look at these more often. At the very least this would help avoid silly panics caused by commodity price and other shocks. However there are also good theoretical reasons for looking at these alternative inflation measures, but that has to be for a later post.